You'll be £12.00 closer to your next £10.00 credit when you purchase Hull Pals. What's this? In response to Kitchener's famous call for a million volunteers, local communities raised entire battalions for the service on the Western Front. Hull folk are reticent people and the Hull Pals were no exception. This book tells their inspiring story of sacrifice and gallantry under appaling conditions. 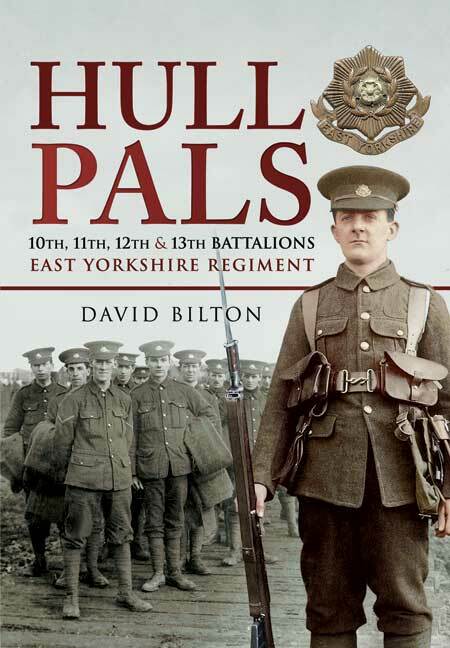 Hull Pals contains a great number of hitherto unpublished eye-witnessed accounts and photographs. As featured on BBC Radio Humberside and in The Yorkshire Post. David Bilton has produced a book which has been well researched and skillfully written. The full poignancy of the Pals Battalion story comes into its own in the main chapters of the book, and David's descriptions are very sobering. This is a book worthy of being read from cover to cover as it tells of sacrifice and gallantry under appalling conditions. The 27 appendices provide extensive details concerning gallantry awards, deaths of officers and other ranks, Battalion Badges, Memorial and standards et al. This book is an absolute must read if you are interested in the role of the Hull Pals...it is packed full of facts, eyewitness testimonies and will be a good reference source for historians. If you read one book to mark the 100th anniversary of the outbreak of the war then this is it. Jim Mitchell, Hull Daily Mail. All of the major battles and events from across the four years and their effect on everyday life are examined in the book, including air raids, rationing, recruitment, censorship and the changes in employment habit. The book also makes extensive use of personal accounts and photographs, as well as newspapers and magazine articles, all of which help to make an informative and atmospheric title. David Bilton is a retired teacher who spends his time looking after his family, working as a University lecturer and researching the Great War. He is the prolific author of numerous books about the British Army, the Home Front and the German Army. His first book, The Hull Pals, became the BBC 2 series The Trench. Since he started writing he has contributed to many television and radio programmes. His interest in the Great War was ignited by his grandfather's refusal to talk about his experiences in Gallipoli and on the Western Front.